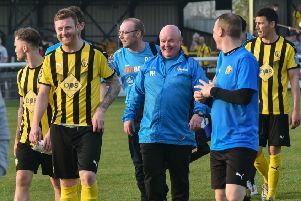 A roller-coaster afternoon ended with Leamington confirming National League North safety with a game to spare courtesy of a creditable draw at Bootham Crescent, writes Paul Edwards. With scorelines in the games affecting Brakes changing constantly throughout the afternoon it was difficult to keep track of the potential permutations but in the end it did not matter as Paul Holleran’s men took control of their own destiny thanks to a superb last-minute goal from substitute Matty Dodd. It was clear to see how much confidence the victory over Chorley had instilled in the players in the early stages as, kitted out in a strange-looking combination of gold shirts and white shorts, they went toe to toe with the play-off chasing Minstermen. Callum Gittings drove a low strike straight at keeper Adam Bartlett, while Aidan Connolly cut in from the right and curled in a low drive that Tony Breeden was forced to push behind for a corner. York skipper Sean Newton backheaded well wide from a left-wing corner as Brakes continued to frustrate their hosts, pushing them back into their own half from another attack with some fine pressing. The hosts came close when Breeden made a superb save from Simon Heslop’s powerful strike, with James Mace well placed on the line to block the follow-up from Newton. Connolly blazed a rising shot out of the ground after working himself into a good position, while Jack Edwards cracked a half-volley just wide but Leamington would hit the front two minutes before half-time. A free-kick was swung into the penalty area from the left by Gittings and put into his own net by the unfortunate Alex Kempster. At half-time, with Gainsborough and Tamworth both winning it was the perfect position to be in. York are still in with a shout of finishing the season in the top seven, however, and began the second half with more intent. Kieran Dunbar looks to show his pace on the left. Connor Brown cut in from the right and fired a shot well wide and Josh Law curled another effort off target before York were level 11 minutes in, Newton slamming the loose ball home after Breeden had made a great save from Connolly. The Minstermen’s number 11 continued to cause problems for Leamington, firing in another effort that Breeden held on to before David Ferguson crashed a shot over the bar. The Brakes skipper was called into action once more as he did well to hold on to a volley from City substitute Connor Smith. Leamington were understandably starting to look a little leggy in their second game in less than 48 hours and Breeden was forced into another save from Newton. With the packed terrace behind the goal baying for a second goal, they got their wish with four minutes remaining. Breeden made yet another fine save, this time from Adriano Moke,but was powerless to prevent Newton from heading in the follow-up. Brakes were flat on their backs now but they picked themselves up for one final push and were rewarded in spectacular fashion when Dodd rose with a defender to meet fellow substitute Liam Canavan’s left-wing cross and glance a header into the top corner to the delight of the 107 travelling supporters behind the goal. Every single player ran to join Dodd as he wheeled off in celebration and minutes later it was mission complete as the final whistle went. And on Saturday the party can really begin as Brakes welcome newly crowned champions Salford City to the Phillips 66 Community Stadium. York City: Adam Bartlett, Connor Brown (Jonny Burn, 82), David Ferguson, Hamza Bencherif, Daniel Parslow, Adriano Moke, Sean Newton, Simon Heslop, Alex Kempster (Connor Smith, 72), Josh Law, Aidan Connolly.Subs not used: James Gray, Luke Simpson, Clovis Kamdjo. Brakes: Tony Breeden, Junior English, Connor Gudger, Joe Magunda (Matt Dodd, 57), Jamie Hood, James Mace, Kieran Dunbar, Callum Gittings, Daniel Udoh, Jack Edwards (Kurtis Revan, 88), Ahmed Obeng (Liam Canavan, 82). Subs not used: Richard Taundry, Shay Nicholson.